This is a follow up post to my last one . 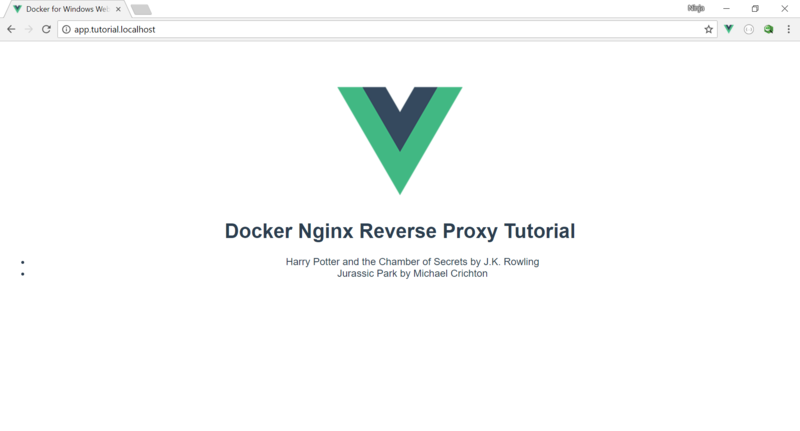 You’ll learn how to add an Nginx container as a reverse proxy serving an api and app container and accessing them through hostnames rather than localhost:port. This provides a benefit of more closely resembling a production environment while you develop locally. Please see the previous post for background on how to setup a local web dev environment using Docker for Windows. This will help you understand how we are adding on to include Nginx. Open Notepad as an administrator (start menu, type in “notepad” right click on Notepad icon and select “Run as administrator”. Select Open File and navigate to the etc folder: C:\Windows\System32\drivers\etc. Select “All Files” instead of Text Documents and open the hosts file. Take a look at our deployment/docker-compose.yml file. You can see that we have added a gateway service that exposes port 80. This is the only way we will be able to access our upstream services like api and app. We no longer have exposed ports to those containers. Every request will go through our nginx reverse proxy, a.k.a. our gateway service. We are now inside the api container and can treat this just like a regular Linux environment. From here, we need to install our node_module dependencies. Test it out by going to http://api.tutorial.localhost and seeing the GraphQL Playground editor. This is an example GraphQL project based on the Apollo Server Getting Started tutorial. Test it out by going to http://app.tutorial.localhost . You should see the example Vue.js app showing the result of the GraphQL “books” query. Now you no longer need to remember the port numbers of your services and this also more closely resembles a production environment since you can access your services by hostname. As you can see, this is a very elegant way to access your app and api during development. I hope this gives you a starting point for a setup that you can use for any future web development projects. This post will help you easily get a local web development environment up and running using Docker for Windows. The benefit of this is no need to clutter your host machine with dependencies or install node/npm directly on Windows. Everything will be installed and run inside of Docker containers. The github example repo that goes along with this post is at https://github.com/ryancp/tutorial-docker-windows. Test it out by going to http://localhost:3002 and seeing the GraphQL Playground editor. This is an example GraphQL project based on the Apollo Server Getting Started tutorial. Test it out by going to http://localhost:3001 . You should see the example Vue.js app showing the result of the GraphQL “books” query. Save the file and switch back to your browser. After a couple seconds, you should see the change without having to reload the browser at all. This is the power of Vue CLI’s Hot Module Reloading feature and because we setup Webpack to watch for changes to our app files (see around line 14 in app\vue.config.js). I hope this has helped you understand how easy it can be to set up a local web development environment for Express and Vue.js based applications. If you liked this, I plan on doing a follow up post about how to add an Nginx container serving as a reverse proxy to your api and app containers. You will then be able to access them through host names rather than localhost:port. This is yet another way to enhance your local dev environment and make it closer to production. So stay tuned for that!